UNITED NATIONS, March 22 -- With bombs, and at least one US plane, dropping on Libya, the UN Security Council on Monday declined to “take cognizance” of a letter from Gaddafi's foreign minister Moussa Koussa, putting off the matter until a briefing by Secretary General Ban Ki-moon in three days. Ban is supposed to be coordinating enforcement of the No Fly Zone provided by Council resolution 1973. At the UN's noon briefing on Monday, Inner City Press asked Ban's spokesman Martin Nesirky to describe the coordination he is giving. The answer was that he attended Nicolas Sarkozy's meeting in Paris on March 19, and is taking in notifications of the countries doing the bombing and transmitting these to the Security Council. Later on Monday, Ban's Spokesperson's Office squawked that seven countries had thus far provided notice: the US, UK, France, Denmark, Canada, Italy and a single Arab country, Qatar. The European side of the list seems to have omissions, like Norway and Spain which is providing refueling. But what of Jordan, the UAE and Saudi Arabia? Are the last two too busy in Bahrain? 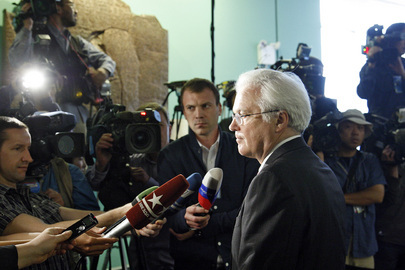 After the Security Council kept Moussa Koussa at arms length -- and Russian Ambassador Vitaly Churkin admonished a Western spokesman for spinning the press about it, click here for that story -- the Council held a closed meeting about Sudan. Inner City Press asked Sudan's Ambassador for his country's position on the action in Libya. We are members of the Arab League, he said, we support that position. But isn't Sudan also a member of the African Union, which has criticized the bombing, and couldn't even get into the country as provided for in the resolution? We are a member of both, Sudan's Ambassador said, leaving the UN microphone. In explanation of the African Union position there is not only the money and support Gaddafi threw around the Continent for so long -- there is also the under reported role on the AU Peace & Security Council of Ramtane Lamamra of Algeria, a country which has strongly supported Gaddafi. On Monday, Lamamra apparently lost his cell phone, as he didn't answer repeated media calls seeking his comment or explanation. 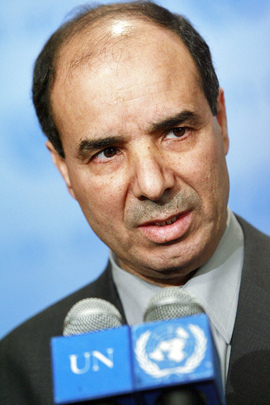 The UN, for its part, did not explain the meaning of the “courtesy passes” spokesman Nesirky said that Ibrahim Dabbashi and Shalgam have been reduced to. Inner City Press asked a lower ranking Libyan diplomat, who said “at least they still have passes.” He added that it is Shalgam who will decide who will speak for Libya on Thursday. Watch this site.